With more than five million downloads, Europa Casino is one of the most popular online casinos internationally. Though it is not that well known as a South African online casino, it has a lot to offer South African players from an instant play version and a downloadable version to a mobile casino you can take with you no matter where you’re going. The casino promises players a really high quality experience and this is evident in the games, the design of the casino’s website and the way in which it interacts with customers. Players will find that they are not short on choice when they play at Europa Casino, as there are more than 400 games on offer including online roulette, blackjack, slots as well as 3D games. There are also a variety of promotions on offer at the casino as well as exciting bonuses and huge progressive jackpots, so that players will have more than enough opportunities to have fun and try to win. Overall, this is a casino that offers players a premium experience. Players who have signed up at the casino will be able to claim a massive bonus of up to R24 000 with a 100% match bonus up to R1 000 every month + R100 free no deposit bonus (Exclusive on Registration). For the first deposit you make every month, you’ll be granted 100% and what’s more, you’ll be able to claim a R250 bonus every week as a reward for loyalty every time you return. High rollers at the casino will be able to claim even higher bonuses. The casino regularly offers limited time promotions based on the month, the season and on current events. Players who want to claim these bonuses should check their email and the casino notice boards for more information. A standard offer in most casinos accepting rand (ZAR), Europa Casino offers players the chance to claim cash back when they don’t win on the games. Applicable only to Wednesdays, players need to just log in and play for the chance to earn their cash back. Players who want to share their great experiences with a friend will receive a R500 boost in their account when their friend registers to play, and additionally, the friend who registers will receive a R200 bonus they can use to try out the games. Europa Casino offers a number of ways to pay and though it does accept a number of international currencies, it has the security in place to act as a casino accepting rand (ZAR) too. Players will notice that though there are a number of payment options to use at the casino, some of which offer bonuses on deposit, not all of these are open to South Africans. The methods South Africans can use include credit card (MasterCard or Visa), Neteller, Skrill, Maestro and Diner’s Club, Visa Electron, Entropay, bank transfer and instant wire transfer. All of these methods are also available for use on mobile, for players who prefer to make their deposits on their smartphones or devices. The Europa Mobile Casino allows you to take gaming on the go and there is no need to download an app. All games can be accessed from your browser and existing members of the casino can use the same details to login on mobile as they do on desktop. For those who want the link to the mobile casino on their phones, there is a QR code you can scan, or you can send an SMS or email to receive the link in your inbox. The list of games available to play at Europa Casino is seemingly endless and between the download, the Flash and mobile casinos, players will be spoilt for choice. Besides the usual games you’d find in an online casino, there are also a number of unique games available to play. You can choose to try the slots and progressive games, all with their own merits or to play roulette or blackjack. The casino also offers live dealer games which will give you the impression that you’re in a land-based casino or the arcade games that are a little different to what you’re used. Video poker is also available, as are scratch cards, baccarat and craps. 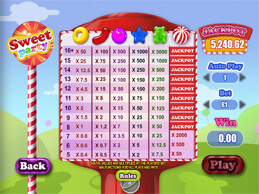 Whether you have a sweet tooth or not, this five reel gaming featuring a huge 63 paylines is one you will want to play, specifically because it is one of the least complicated games you’ll ever come across. With both high and low bets available to be placed, the game offers a number of good features such as jackpots and multipliers, but once you play, you may notice that something is missing. This is a game that has both no bonus games, and no wilds, which makes it a bit of an anomaly as far as Playtech games are concerned. However, the colourful look and feel and the easy to use functionality are great, especially if you want to play a game you don’t have to spend much time thinking about. It will make you feel like a kid in a candy store, although that could be because you’ll be surrounded by jelly babies, gummy bears, hard sweets and much more. The sweet to keep an eye out for is the red and white striped one that will start dishing out the prizes if you find at least five on a payline. Should you find 16 or more symbols of the same type on the reels, you’ll receive the biggest prize. 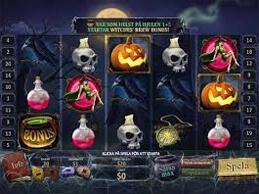 No matter what time of year it is, Halloween fortune has a spooktacular number of prizes to offer players who are brave enough to wager on its paylines. However, you’ll have to tread lightly in this spooky game, which features ghostly sounds and ghoulish graphics, all adding to the scary theme. It is the bonuses you’ll want to go looking for as the game features a number of cute but weird bonus games and a few creepy bonuses. Find the five Jack ‘o Lanterns and you’ll be rewarded with the game’s top fixed jackpot, which is set at 10 000 coins or activate the bonus feature where you’ll get to draw cards for a chance to win even more cash. The witches’ brew bonus game allows players to choose a witch they think is hiding big bucks and depending on the witch you choose, you’ll reveal loads of free games. But that’s not all guys and ghouls. You’ll also be given the option of choosing a potion in order to reveal a multiplier and the two bonus features in combination could add up to some wild prizes. Europa Casino caters to players from all over the world, and though you wouldn’t call it a South African online casino, it does do a good job of providing a number of great features that South African players would look for. These include excellent customer service, great security and the chance to win a lot of money play over 400 games.